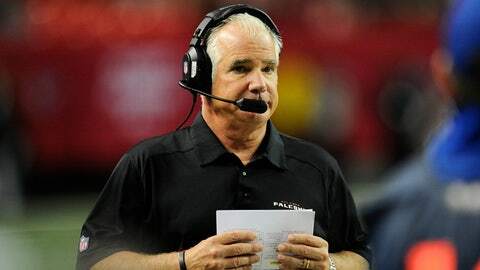 Falcons coach Mike Smith's team is preparing to face two playoff-caliber teams, the San Francisco 49ers and the Carolina Panthers, in the closing weeks of the season. FLOWERY BRANCH, Ga. — In recent years, the Falcons have been a playoff-bound team facing opponents with little or nothing to play for in the closing weeks of the season. The results have been ugly, too. In Week 15 of the 2011 season, they faced a Jacksonville team that had already fired head coach Jack Del Rio. The Falcons demolished the Jaguars 41-14 at the Georgia Dome. Two weeks later that season, they hosted a Tampa Bay team in the regular season finale that would end up firing its head coach, Raheem Morris, the next day on the heels of a 10-game losing streak. The Falcons won 45-24 over the listless Bucs. No one is suggesting that head coach Mike Smith’s job is in jeopardy but, as they sit at a disappointing 4-10, the Falcons could find themselves on the flip side of that dynamic, as they face daunting opponents in the next two weeks. In a rematch of last seasons’ NFC Championship Game, the Falcons visit San Francisco on Monday night. At 10-4, the 49ers still have a shot to win their division, the NFC West, and possibly even home-field advantage throughout the playoffs. The same is true the following week when the Falcons host NFC South rival Carolina. Both teams boast physically punishing defenses with the ability to rush the passer. The 49ers rank third in the NFL in opponents’ points per game and opponents’ yards allowed. "They really carry the identity of — not a bully team — but a physical team that goes out and, you know, tries to punk you," said Falcons safety Thomas DeCoud, who grew up in the San Francisco Bay Area, as his grandfather played for the 49ers in the 1960s. "And if you let them then it’s going to be a long day for you. We just have to match that intensity, match that level of physicality and that attitude of ânot today’ so we just have to go out there and play hard." So far this season, the Falcons have done well in continuing to play hard despite having been eliminated from the playoffs. Last season, in a game in which they had nothing to play for, they put forth one of their worst performances of the season. The Falcons already had locked up the No. 1 seed in the NFC for the playoffs but Smith elected to play his starters and lost to a 7-9 Tampa Bay team by 22-17 at the Georgia Dome. "I don’t see the Falcons as that type of team," said San Francisco quarterback Colin Kaepernick in a conference call on Thursday with Atlanta media members. "They’re going to play hard till the end." Smith and quarterback Matt Ryan have both resisted the idea of resting Ryan in the final two games so that he doesn’t get hurt, as Washington has done with starter Robert Griffin III. One thing that remains to seen is whether the Falcons continue to play young players to the same extent as they have recently. On the defense, rookies played 47 percent of the snaps last week in a 27-26 win against Washington. Along the offensive line, undrafted rookie Ryan Schraeder started at right tackle last week and played every snap, giving up one of the team’s three sacks allowed. San Francisco has a top pass-rusher in Aldon Smith, who has 8.5 sacks in nine games. "I think it comes down to being a professional and taking pride in what you do," Ryan said. "Obviously, they’re right in the mix of everything and we are not. It is what it is. We’re at where we’re at and we need to be professional and to go out there and play the way we’re capable of playing and I think if we can do that we can match or top their intensity." Smith has done a good job of keeping the Falcons comptetitive over the last four weeks as questions have come about the status of coaches and veteran starters have seen less playing time. The Falcons are 2-2 over that span, their best record over any four-game period this season, and those losses have come by a combined five points. Smith said he is not worried about the potential that the last two games could get out of hand, which would be difficult for any coach to admit publicly. "I think, as I told our guys at the start of the fourth quarter of the season, it doesn’t matter if you’re 2-10 or 10-2 when we start that fourth quarter. We all have the same goal and that’s to finish strong. That’s what our mindset is. The teams that are playing for playoff spots, they want to finish strong as well. I don’t think it really changes your attitude at all."